Snapshot: Archivision Hirotani Studio transformed a heavily divided space into an open, continuous nursery for 140 children in Asahi’s Owari district of Japan. 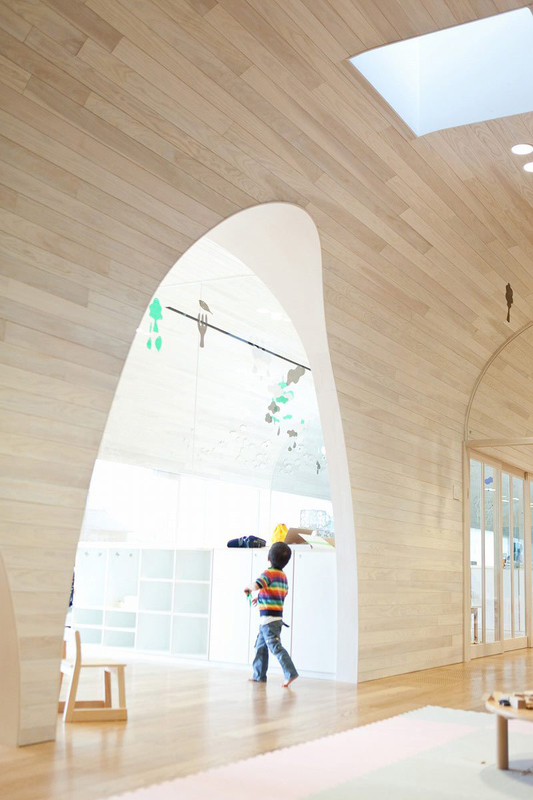 Inspired by three-dimensional picture books, Archivision created a continuity of spaces where wainscoted walls and ceilings create a tunnel-like effect, various sized arch shaped partitions evoke playfulness, and individual cubbies and shelves blend seamlessly into the interior architecture. The space is designed to cultivate a sense of imagination and wonder amongst the children. “The tots are able to play in underground cities, inside submarines, underwater, inside clouds, each expanding their image of space, going from one area to another through the arches, and “becoming aware” of the changes of light coming from the ceiling windows, finding a place to his or her liking where time passes by.” Explained Hirotani Yoshihiro, founding architect at Archivision. Ceiling hung, translucent green mobiles reflect the natural light that filters in through the windows to create light-tinted green shapes on the walls. Tiny kiddy-doors exist to allow the children to move from space to space during playtime. Additionally, illustrations adorn the glass partitions to give the children a sense of closeness with art and to visually enhance folktales told during story time.